This weekend I realized that most people who know me now and have only gotten to know me over the past few years don't think of me as an artist. This stings a little. But I have not thought of myself as an artist in a long time. When I came to this realization of how I am currently primarily perceived, as a vegan. To those that have had my cooking I'm also thought of as talented in the kitchen. Since I became vegan I have spent a lot more time cooking and it really is my creative outlet. Even when it doesn't feel very creative to get recipes from the Internet, follow the instructions and have a usually tasty dish in the end. That process of finding the correct way to do something and executing it is not too far from what my fine art practice was. I put my own spin on things I had learned. 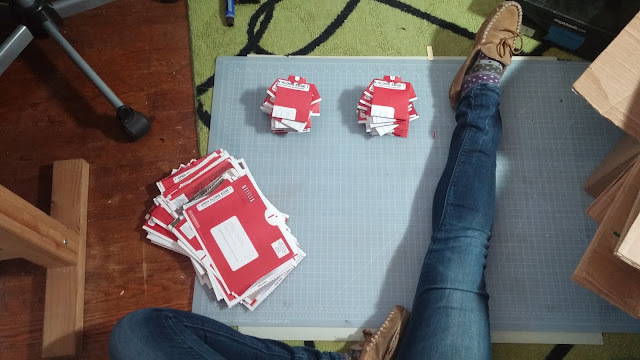 So I resolved to organize my studio this weekend, which ended up being for a couple hours yesterday and about an hour and a half this morning. It is still a mess but as I went along I kept looking at the stack of Netflix papers I still had, waiting to be folded into collared t-shirts. So when I came to a stand still in organization with a bunch of odds and ends piled around the room I just started folding. The entire process was pretty painfully self aware. Composing this blog entry in my head. Wondering what I should dedicate my creative time to. 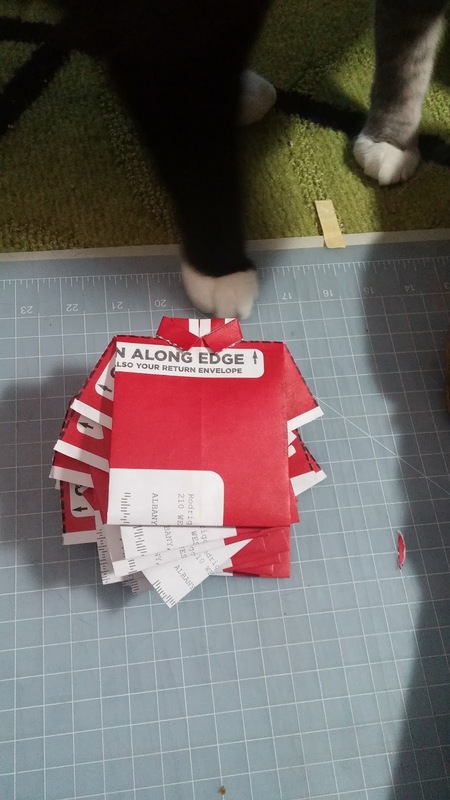 Questioning if my piles of folded paper shirts will end up anywhere other than boxes in my studio or ultimately the recycling bin. Do I do this because I have a compulsion to do this? 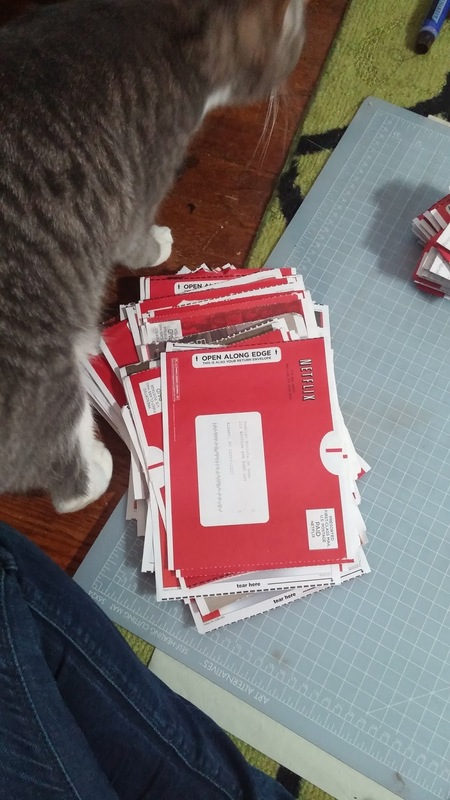 It can't be that because this pile of unfolded paper was sitting here for a long time, we don't even get the discs from Netflix anymore. But now I spend even more of my free time watching Netflix. Maybe I should cut myself off from any social media for a while then I'd get things done... Maybe or maybe not. I will try to focus on one thing at a time. But it's hard not to have my attention drawn to all the potential projects that could I could benefit from: mini versions of my 16mm film covered shadow boxes, knitting hats and scarves and gloves, folding paper, making books, making paper, making clothing, cleaning the house, starting projects on the house, starting a garden ... I feel like I could go on forever. Looking at the piles I folded helps me calm my rushing mind, if only a little bit. This entry really speaks to me. Realizing that I am also primarily perceived as a vegan by most friends and family. Most don't know much about my acting and singing that has been put on the back burner for the most part. I don't like to talk about it anyway, because I haven't made creative progress in some time. Personal and public identities often clash so.